Colorful Star of David charm decorated in the Millefiori pattern, a technique used by Adina Plastelina using polymer clay. The Star of David is known as a symbol of the Jewish People. 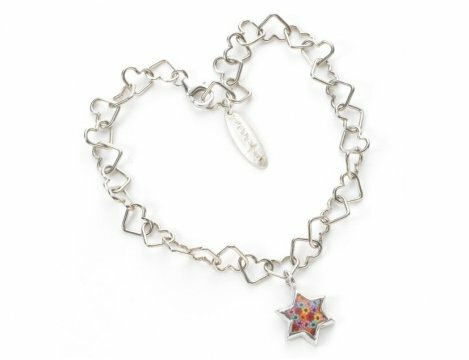 18cm sterling silver bracelet with a sterling silver Star of David decorated in the Millefiori pattern. Millefiori is a distinctive pattern on glassware that is similar to mosaic design with a colorful design. Translated into Italian it means 1000 flowers. Using the Millefiori technique, this Star of David decorated with a flower pattern is colorful and vibrant. The Star of David has become known as the symbol of the Jewish people. Designed by the well-known Adina Plastelina, this bracelet is the perfect piece of Israeli jewelry that can be worn day or night no matter what the occasion is. Adina Plastelina uses Millefiori technique with her own personal touch, by using polymer clay and transparent enamel to create a rich, colorful and shiny product.